Caution re overestimation of Phosphate by orders of magnitude! In 1669, Hennig Brand of Hamburg brewed a concoction that yielded a mysterious product; one that, unlike any other substance known at the time, glowed in the dark by its own power and ignited spontaneously when exposed to air. He called it phosphorus, meaning light-bearing, from the name given by ancient Greek and Roman astronomers to the planet Venus when it appeared in the sky as the morning star. Of several hundred phosphorus compounds isolated from living cells, three deserve particular mention: DNA (deoxyribonucleic acid) and RNA (ribonucleic acid) are general classes of polymers, and ATP (adenosine triphosphate) is a small molecule that drives energy-requiring synthetic reactions in cells. Phosphates enter into the economy of man in many different ways. Their principal uses are: in fertilizers, in detergents, in animal feeds, and the remaining distributed among a variety of applications such as leavening agents in baking powders and cake mixes; anticorrosion agents for car bodies; fireproofing materials; chemical agents in some types of water softeners; smoke bombs and incendiaries; insecticides; rodent poisons and lethal nerve gases; and as additives to gasoline, "muds" used in oil drilling operations, bottled "pops" and tonics, toothpastes, dental cements, matches, and plasticizers. Note how the uses range from life-promoting fertilizers to deadly poisons intended for rodents, insects, and man. One drop of sarin, a lethal nerve gas containing phosphorus, if not immediately washed from the skin, can kill a man as rapidly as a bullet through the brain. As little as 0.6 mg (0.00002 oz in weight) of elemental phosphorus, an amount equivalent to a few grains of salt, can induce hepatitis in man. A dose of 100 mg (0.003 oz) results in death. 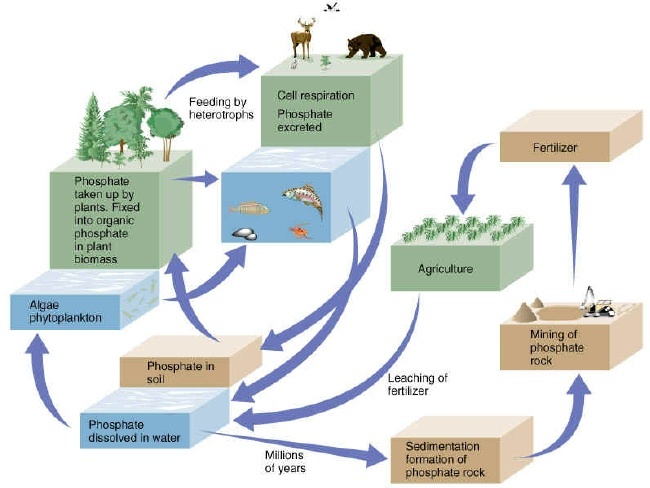 Phosphorus may enter a water body through the inflows, precipitation, dry fallout and from the sediments, and it may be removed by sedimentation and through the outflow. Nitrogen has a more complex pathway. In addition to the inputs and outputs described for phosphorus, nitrogen can enter and leave a water body in the form of free nitrogen gas (N2-) through atmospheric exchange. Carbon has been shown to diffuse into the water column at rates sufficient to meet the needs of photosynthesizing cells. Phosphorus, on the other hand, cycles between living and nonliving particulate forms and the dissolved form. The different pathways of phosphorus, nitrogen and carbon in lake metabolism make phosphorus the obvious choice for eutrophication control. A certain reduction of phosphorus input will generally result in a greater reduction in algal biomass compared with the same reduction of nitrogen. Furthermore, the reduction of nitrogen input without a proportional reduction in phosphorus, creates low N/P ratio which favors nitrogen fixing nuisance algae, without any reduction in algal biomass. Total Phosphorus and not other phosphorus species, is considered the key variable for practical rather than theoretical reasons. Total phosphorus includes some or all of the following fractions: crystalline, occluded, absorbed, particulate organic, soluble organic and soluble inorganic phosphorus. 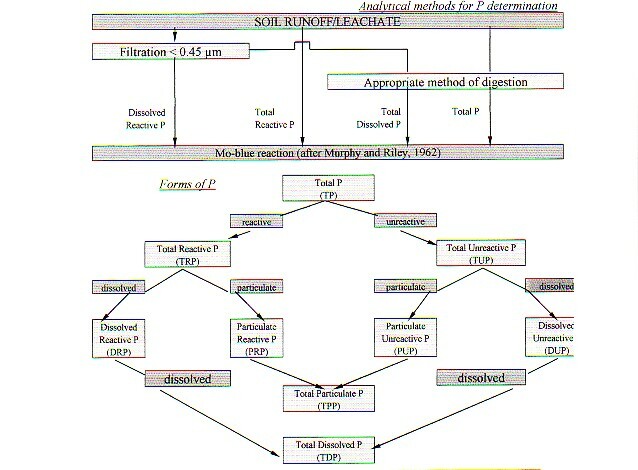 Out of these fractions, the three biologically available phosphorus (BAP) fractions listed in order of decreasing availability are soluble reactive phosphorus (SRP, a mixture of dissolved inorganic and organic species measured by the method of Murphy and Riley, 1962), soluble unreactive phosphorus (SURP, some include dissolved phosphorus fed by persulfate oxidation, and is available for phytoplankton by enzimatic hydraulisation which frees organically bound fractions), and "labile" phosphorus (associated with soil particles and dissolves into an aqueous solution as determined by the sorption isotherm method of Tayler and Kunishi, 1971). However, the term biologically available phosphorus (BAP) still remains somewhat vague because it describes a mixture of phosphorus fractions of different availability. Whether the P is in a dissolved or particulate form. This is most often differentiated by a 0.45 �m membrane filtration. Whether or not the P is molybdate (Mo) reactive, according to the Mo blue reaction (Murphy and Riley, 1962). As a general rule, Mo reactive P (RP) is considered to be inorganic and unreactive P (UP) is thought to represent organic P. RP is free and readily mobile. UP is less labile and can only be determined as the difference between total P and RP. Total P is determined by an appropriate means of digestion (Rowland and Haygarth, 1997) which hydrolyses forms of P which would be otherwise occluded from Mo reaction. Thus, by applying the combination of Mo reaction, digestion and filtration it is possible to define nine forms of P in water. Where suitable conditions develop at the water sediment interface, substances contained in the sediments, including nutrients, are released into the water column. Below compensation depth (in the tropholytic zone), net oxygen consumption occurs in a eutrophic lake. As alternate TEAs (terminal electron acceptors) are consumed, Eh (environmental redox potential) decreases. Eh tends to decrease with greater depth in the water column and in sediments. Once the Eh of the ferric-ferrous iron couple is reached (@ approx. 120 mv, Kortmann & Rich 1994), both soluble ferrous iron and soluble phosphate accumulate. If Eh continues to decrease, sulfate is reduced to sulfide (@ <-75 mv, Kortmann & Rich 1994), which can remove iron and permanently reduce phosphate binding capacity, by interacting readily with ferrous iron to produce ferrous sulfide (FeS). If FeS precipitates to form pyrite (FeS2), ferrous iron is no longer susceptible to oxidation to ferric iron with the return of aerobic conditions. Bacterial reduction of ferric hydroxy-phosphate complexes results in large amounts of soluble inorganic phosphorus and ferrous iron diffusing across the sediment-water interface causing internal loading. The relationships among sulfur, iron, and phosphorus binding capacity raises questions about potential impacts from increased sulfate loading by algicide applications (copper sulfate), alum treatments (aluminum sulfate), and acid rain (sulfuric acid). Ferrous iron is reoxidized when it encounters oxygen (from the trophogenic zone) to insoluble ferric iron which binds with orthophosphate. Accumulated hypolimnetic phosphorus can be transported to the trophogenic zone by eddy transport or wind mixing episodes, and can have dramatic effects on autochthonous production. It is now widely recognized that the mixing processes (principally induced by wind force, sometimes even by several high power motorboats) which occur between sediments and the overlying water play an important role in the overall phosphorus release from the sediments under both oxic and anoxic conditions. This seems to confirm that internal loading of phosphorus is a more serious threat in shallow lakes than in deep lakes, where in the latter case, the substances released are prevented from entering the epilimnium during periods of thermal stratification. Experience gained in various lake restoration schemes suggests that the history of accelerated eutrophication, that is, the length of time the lake has been eutrophied, has an important bearing on lake behavior with respect to internal loading and phosphorus retention in the sediments. Sediments remain oligotrophic and only become gradually eutrophic, long after the water mass becomes highly eutrophic (Schindler et al). Conversely, the highly eutrophic sediment would remain eutrophic long after the external load is reduced and would thus delay the recovery of the lake. In some shallow highly eutrophied lakes with a long history with eutrophication (Ryding and Forsberg), 22 to 400% of the external phosphorus load was released from the sediments after reduction of the external load. Phosphorus is also released from lake sediments to well aerated water. Jensen and Andersen (1992) have shown that Fe-bound P, when present in significant proportions in the sediment, may be a major source for internal P loading in shallow, eutrophic lakes, just as it may be in deeper, stratified lakes. Holdren and Armstrong (1980) per Fricker (1981) quoted literature values of sediment phosphorus release rates from several lakes in the United States for aerobic (0 to 13 mg P m-2 day-1) and anaerobic conditions (0 to 50 [max. 150] mg P m-2 day-1). Two different mechanisms have to occur simultaneously or within a short space of time. Firstly, P bound to particles or aggregates in the sediment must be mobilized by being transferred to the pool of dissolved P (primarily phosphate) in the pore water. Secondly, processes which transport the dissolved phosphorus to the lake water must function. Important mobilization processes are desorption, dissolution, ligand exchange mechanisms, and enzymatic hydrolysis. These processes are affected by a number of environmental factors, of which redox potential, pH and temperature are the most important. Essential transport mechanisms are diffusion, wind-induced turbulence, bioturbation, and gas convection. Redox-controlled dissolution and diffusion are considered as the dominant mechanisms for P release from stagnant hypolimnetic bottom areas. All the mobilization and transport processes can theoretically contribute to the overall P release from sediments in shallow lakes. At high temperatures microanaerobic zones are formed very rapidly, and redox-controlled liberation of phosphate can occur to well-aerated water. Wind-induced turbulences often have a dominating role among the transport processes. Non-humic lakes in the Atlantic Region seem to conform with the expected lake behavioural pattern established by the (nearly 150) OECD lakes. 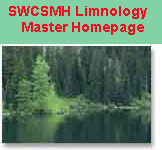 Other lakes in the Atlantic Region exhibit particular properties, e.g. high colour caused by humic substances, which cause them to depart from the standard behavioural pattern derived from the OECD lakes. In these coloured lakes, a substantial part of the total phosphorus present is associated with dissolved organic substances and is not readily available for phytoplankton growth. For this reason, humic, coloured Atlantic Region lakes at a given phosphorus concentration maintain a lower algal biomass as indicated by chlorophyll, than that predicted from the OECD relationship. Phosphorus associated with dissolved humic substances is not eliminated from a lake as readily as phosphorus associated with phytoplankton. Flushing corrected predictions underestimate lake concentrations of total phosphorus, but this compensates somewhat for the less mobile nature of phosphorus in humic lakes. Therefore, average chlorophyll values predicted from loading fall below but nearer the OECD relationship than those predicted from measured lake phosphorus concentration. Peak chlorophyll is even more closely predicted from loading than average values. This is a consequence of the equalization of the compensating effects. The proportion of total phosphorus which is available for plant growth may increase at times of peak biomass and reflect a finite binding capacity for inactivation of phosphorus.